Why not play Morgan Mahalak NOW? In the tradition of FishDuck.com articles that make you ponder, I ask Duck fans to address questions concerning a quarterback at Oregon most have already written off: Morgan Mahalak. You will learn some new things here, and they have not come from an interview with Morgan, but from snippets of interviews with other Oregon players who have happened to mention him. There are also a number of boosters and coaches who still get to see practices on occasion. Thus, I’ve pieced this article together from the combined observations of players and other program insiders. The bottom line is that basic impression people have of Mahalak — the views that reside on many Duck message boards – are wrong. 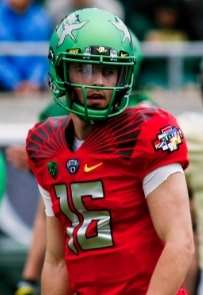 When Mahalak joined Oregon in 2014, I heard some rumblings that his throwing accuracy was right up there with Marcus Mariota. At the time, I brushed it off. Nice to hear, but I needed more reliable confirmation. Morgan ran the scout team that fall, simulating the opponent’s offense every week in practice. He hurt his shoulder in early October and struggled through the rest of his inaugural season in Eugene at less than 100%. My question to those who say Mahalak is not ready for the spotlight: How can you be ready to run the Oregon offense when you have only run the scout team in practice? Fast forward to last spring and an observer at Oregon practice told me Mahalak was once again injured, as it was clear he was in pain when throwing in practice. Was this a continuance from the previous fall, or a brand new injury? I wrote nothing after hearing this report, as I respected the coach’s need for silence regarding injury information. Morgan with the beautiful zone read on an inside linebacker! Morgan’s spring game performance was mixed; his execution of the zone read (shown above) was superb, while his passing didn’t appear to click based on casual observation. The injury diminishing his reps would account for part of that. Yet when I went back and watched the spring game, Morgan did not have the benefit of the first- or second-team skill players. They left the field with Jeff Lockie, and returned with Lockie. Mahalak got third- and fourth-teamers and even walk-ons for his surrounding firepower. Does anyone shine under those conditions? 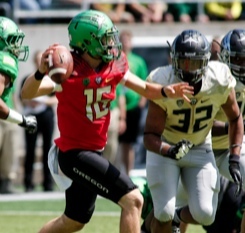 How about a series or two with Bralon Addison and Darren Carrington as his wide-outs? When Vernon Adams showed up for practice, guess who lost practice reps in order to bring Adams up to speed? Mahalak is again running the scout team this fall; this is not because he got beat out by Adams, Lockie, and Taylor Alie, but because he has not had a chance to compete with them in running the Duck offense. The coaches say he is “not operationally ready,” which is certainly true. But I ask again, how can Morgan be expected to run the Oregon offense without getting reps in the Oregon offense? Morgan Mahalak throwing in the spring game. The whispers I have been hearing recently is that Morgan has been throwing exceptional passes for the scout team this fall, as he is finally healthy. The rumors continue with how he is throwing many more touchdowns in practice this year against both the scout defense and the first-team defense (not all of that is due to the weakness in the secondary, mind you). 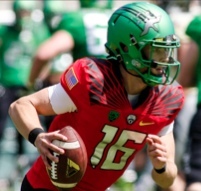 The collective opinion of my practice observers also surprised me with their thoughts on who Oregon’s fastest QB is, now that Ty Griffin is with the defenders. It is indeed Mahalak – over even Travis Jonsen! I was not surprised to hear this, as I had been thinking the same thing last week at halftime of the Colorado game. It was all I could do last week to keep from sharing those terrible thoughts with all of you. A few minutes later I heard a young female voice behind me say, “It’s going to be a long f**king season.” Since Dano and I both have knee issues and hobble along slowly — the youngster passed me and I could see that she and her friend were students at UO. Thus both middle aged and young fans share my dire conclusions for this year. Ouch! Funny, painful and true. Mahalak is faster than the rest of the Oregon QBs? My friends, the coaches went all-in on Adams, and I understand why better than most. But most all of us know that a broken finger does not heal quickly, and even when VA returns, he will not be the Adams we saw at EWU. This strategy was a huge risk for both the coaches and Vernon, and both sides accepted that risk up front. The coaches want to win games now and not build for the future. But how many games can we realistically win — both this year and next (Lockie is a junior, folks) — with QBs that cannot throw accurately more than 15 yards down the field? It was heartbreaking to see the WSU safeties so close to the box last Saturday. They could cover the short routes they knew Oregon would have to run, and still be there for run support in two strides. We had no vertical threat, and that will not change this season. The question becomes … build for the future or try to salvage the season? A QB such as Marcus who was brilliant as a redshirt freshman is an anomaly. However, it often happens that a redshirt sophomore comes out blazing and goes from afterthought to productive starter in the blink of an eye. Mahalak can be that stud redshirt sophomore next fall. All the physical tools are there; he just needs the reps to get the mental part down. Give him game experience NOW, and let his talent refine itself this season in the Duck system. We will lose games with him playing major snaps in 2015, but these are games most likely lost anyway. Vernon should only play when the finger is 100%, and that is probably a long way off. Our best chance at another win is likely in the Civil War. By then, Mahalak could become a serious threat pushing the ball 20-plus yards downfield to Oregon’s fleet of talented receivers. 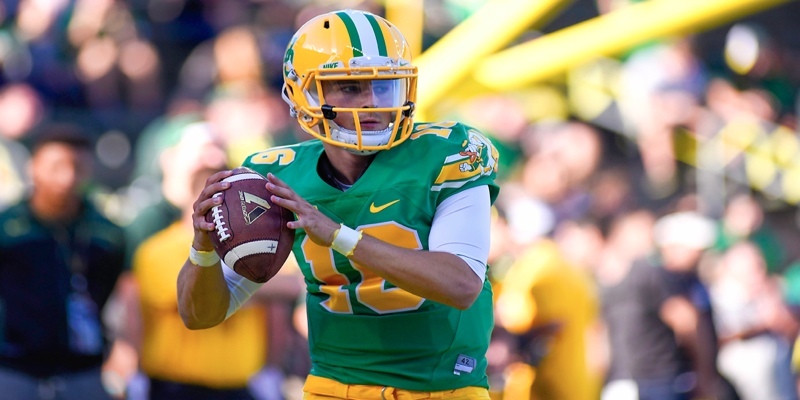 This game experience will help him be ready to make Oregon a winner again in 2016, which will make this year simply a blip season over the long term. So I ask you, FishDuck.com faithful: why not play Morgan Mahalak NOW?